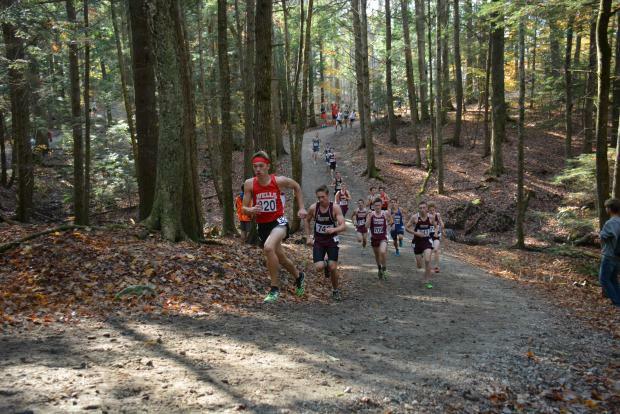 A total of 339 male runners in all three classes completed the course at Twin Brook Saturday during the Maine State Championships. Only eleven of them did it in less than seventeen minutes; just one, Yarmouth's Luke Laverdiere, did it in less than sixteen minutes. Laverdiere's 15:43.89 was about a minute and four seconds better than runner-up Mitch Libby from Wells who came it at 16:67.43. What does 1:04 mean in terms of distance over the ground? The State's best female sprinters qualify for the state meet at 1:05. On a track, using blocks. Sprinting. But while Laverdiere's race had all the flash, the group effort from Lincoln Academy easily wrapped up the team title. The tempo runs the Eagles have been doing--during meets--in the month of October clearly paid off. The Eagles fifth finisher, Jojo Martin, crossed 21st in the 110 runner field. Martin had run in the JV race at the KVAC meet two weeks ago, perhaps in deference to seniors on the large Lincoln Academy team. The Eagles finished with 56 points. Runner-up Freeport finished with 114 points. The 58 point margin was the widest in any of the six races during the day. Sam Russ (4th, 17:11) and Jarret Gulden (6th) finished in the top ten. Other scorers for the Eagles were David Barnum (11th), Benji Pugh (19th), and Martin. Other top ten runners on the day were Cape Elizabeth's Jack Bassett (3rd), Nick Dall of Waterville (5th), Griffin Allaire of Wells (7th). Martin Horne led the runners-up Freeport Falcons with an 8th place finish. 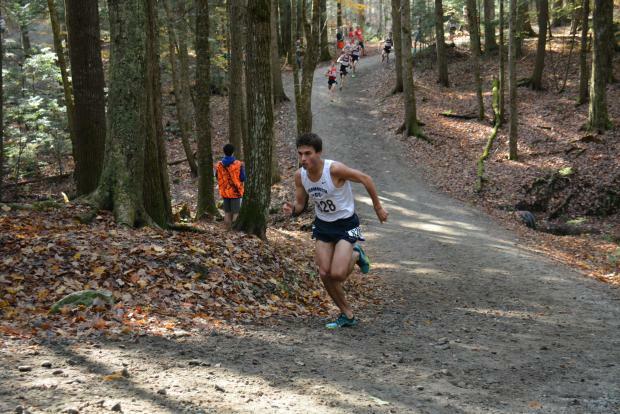 Dylan Marrero of the Caribou Viking pack was 9th, and Washington Academy's Matyas Nachtiagall rounded out the top ten. Laverdiere entered the Hill Loop, a bit past the half mile mark, with a six second lead over Libby was who at the front of a dozen runners in the chase pack. 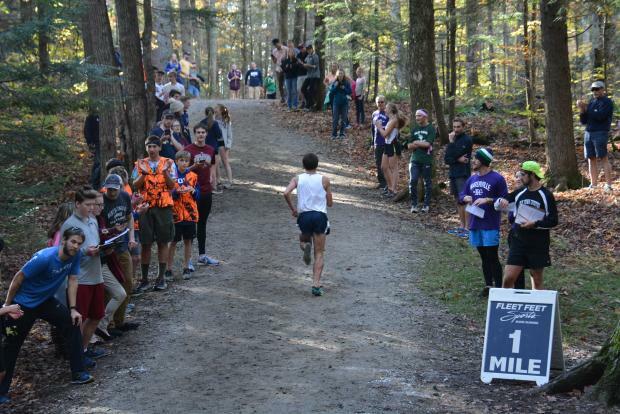 By the mile marker Laverdiere was all alone and stretched his lead over Libby to 12 seconds. 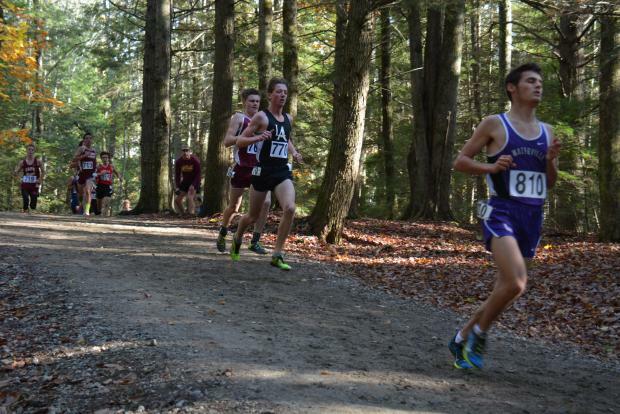 At the same time the hills had done their work, the pack had broken up and Libby held a decent lead on Waterville's Nick Dall and Lincoln Academy's Russ. Russ had entered the woods 13th with Gulden and Barnum trailing him by another ten runners so when he emerged at the far end of the loop in 4th and with Gulden and Barnum having moved up to around 12th or 13th it was evident that the Eagles had made the best of the first pass through the Hill Loop and had begun to pick-off the field and were on their way to the title.